Our range of pump cleats are designed to allow the line to run freely right up until the the line or rope is lifted. Once the rope is lifted the pump cleats and it will only release again once the rope is flat on the deck. 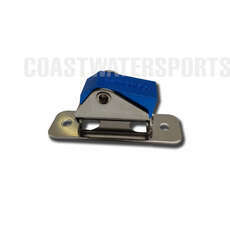 These pump cleats are designed for different classes of dinghy and can offer control and safety while out on the water. Take a look at our pump cleats and discover how you could improve your sailing dinghy today. You won’t regret investing in our expertly manufactured Northfix pump cleat, that’s a promise. If you’ve got any questions or would like to find out more about other sections, for example clamcleats, cam cleats and wedges & risers then get in touch. There’s plenty of dinghy fittings to choose from across the collection and we know you’ll find the item you need. Our prices are often unbeatable with many items on sale or discounted, so be quick and take advantage while you can.